The above quote is often attributed to Marilyn Monroe, but was more likely said by psychologist and LSD guru Timothy Leary. Either way, it should be the slogan of the US women’s national soccer team’s radiantly ambitious history. Over three decades, it has traveled the distance from non-existence to a place at the top of this nation’s soccer world. Think about that: In the lifespan of Rihanna, these women have become more watched, more profitable, and more successful than their male counterparts. This wasn’t merely accomplished through the power of their play but through struggle. That’s why the nuclear lawsuit filed last week with the Equal Employment Opportunity Commission (EEOC) against US Soccer by the elected leadership of the team was so significant. This extremely public action—coupled with interviews across the media landscape—are best understood as part of a historical continuum: the latest chapter in an ongoing narrative of how women’s soccer has developed in this country. Solo is right that the numbers speak for themselves. Here are some of these pesky digits: 20 million. That’s how many more dollars in revenue the women produced in 2015 compared to the men’s team, while the fellas were paid nearly four times as much in salary and bonuses. That’s according to US Soccer’s own financial reports. Another number is 25.4 million. That’s the number of people who watched the 2015 World Cup Final against Japan, making it the most watched soccer match—male or female—in the history of this country. Then there are the smaller numbers: The women receive $10 less per day than men for their meal allowances on the road. And yet numbers, a.k.a “logic,” have never been enough to ensure equality in women’s soccer. This team’s actions have to be seen as part of a long-term tactical struggle for respect. 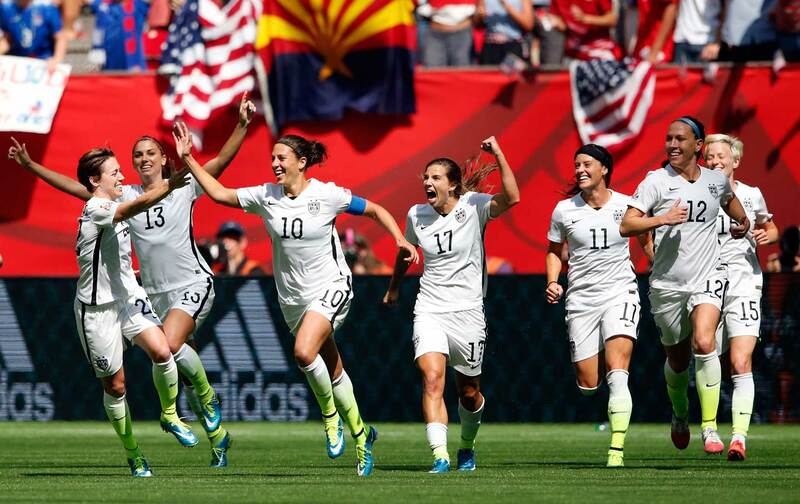 Women in US Soccer have always had to fight for their fair share of resources and attention. In the 1980s, the national team existed without either a FIFA World Cup to compete in or an event at the Olympics. They received $ten a day in meal money, and practiced on fields that were graveyards of torn ligaments. “Men’s soccer got all the money and respect. That’s just the way it was,” 1999 team co-captain Michelle Akers said. This began to change with a new generation of teenage players, 15- and 16-year-olds who were “Title IX Babies”: the first generation of US women raised with ready access to play. They included Julie Foudy, Joy Fawcett, and Mia Hamm. In 1991, FIFA finally held the first women’s world cup in China, but FIFA was so concerned about sponsoring a failure it did not want to even bestow the World Cup brand on the proceedings and called it “The M&Ms Cup.” That women’s team dominated, becoming the first US soccer team to even make the finals of a world tournament—juniors or seniors, male or female—at any level. The people of China treated our players like rock stars, and they thought they would return home to a grand welcome. Instead, they boarded a 52-hour flight back, and waiting for them at JFK airport was a grand total of three people. Their athletic and publicity breakout happened at the 1996 Olympics, but not before they had to wage a fight. In the lead-up to the Atlanta games, the players knew that this Olympics on US soil was a tremendous shot at amplifying their sport. They also knew that they were being disrespected by the men who watched over the sport they loved. The women’s team was getting $1,000 a month, and a potential bonus only if they won gold. The men faced no such hurdles. The players wisely went to the source on questions of equal pay and respect: tennis legend Billie Jean King. In addition to being a feminist pioneer in sports, King was also the founder of the first-ever women’s athletic union. “I told them, you just don’t play. That’s the only leverage you have,” she recalled to HBO Sports. The soccer powers, backed by the United States Olympic Committee, brought in a group of scab players, but eventually caved. The 1999 World Cup was the culmination of this tight-knit team. They sold out Giants Stadium and the Rose Bowl—and did it by marketing the sport straight to fans, in clinics for young girls around the country. The crowd was very young, and very female. They were and are the most under-served audience in the sports world. Now this new generation is taking up this torch. They know that US Soccer telling them to “just wait until the next collective bargaining session” is another way of just saying, “Just hurry up and wait.” They know that their careers in this high-concussion/high-injury sport are finite, and you have to actually fight and raise your issues to the public, beyond the collective-bargaining table, if you are ever going to see change. They are seizing the time and it is a great example for all of women’s sports. And that’s what makes it both so important and so dangerous to the powers that be.